Crawling along the A21 behind a UPS van on the school run this morning got us thinking: how much of the increased traffic at this time of year is down to delivery services fulfilling the huge number of Christmas orders placed online? According to a recent survey conducted by the Institute of Mums, two thirds of Christmas present shopping will be done online this year, with as many as 1-in-10 mums not bothering to venture out to their high-street stores at all this month (except perhaps to pick up the odd pint of milk or loaf of bread). The Institute of Mums surveyed 1,218 parents during the first week in December and found that parents spend an average of £122 on Christmas presents per child under the age of 5, rising to as much as £215 for teenagers. This amounts to a total spend of more than £2 billion – just on our kids! But with as many as 46% of households with children under the age of 10 subscribing to Amazon Prime – the £79 per year subscription service that comes with free next-day delivery on most orders at the site – it would seem that little of this money will be spent on the high street. The benefits of shopping online are clear, with an overriding perception that you will pay less if you buy online. But how much truth is there in this? According to the Institute of Mums, as many as half of the toys currently listed on Amazon Prime are being sold through the FBA (Fulfilled by Amazon) program, which lets 3rd party sellers send items to Amazon’s storage facility to be sold under the Amazon Prime umbrella. These retailers typically set their own prices, independent of the market’s recommended retail prices, and often at a higher price than Amazon sets for its own products. The practice is known as arbitrage and centres around finding a product at a low price from one supplier and selling it at a higher price online. 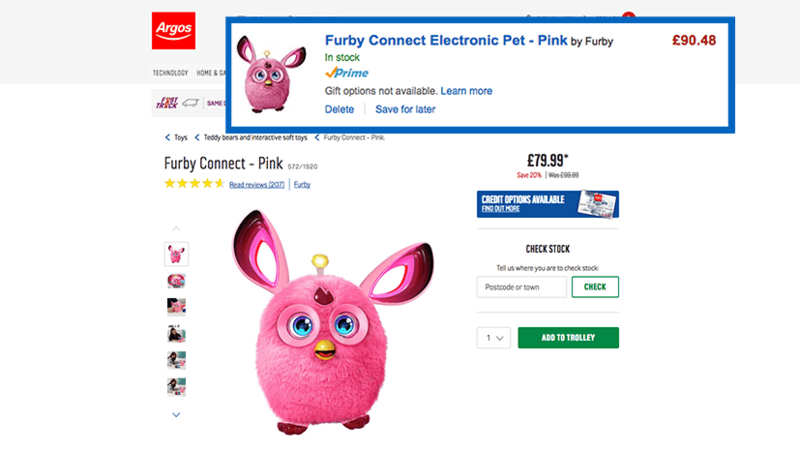 Keen to examine the practice and test the belief that the best bargains are to be found online, the Institute of Mums compiled a list of 150 popular children’s toys currently being advertised on TV, and found that over half could be purchased for less money from high street stores like Argos and Toys R Us. “I first came up with the idea for this study after my daughter asked for a Baby Annabell doll for Christmas,” said IOM founder Jessie Wilson, who was surprised to find the doll £20 cheaper in Toys R Us than on Amazon, and even more pleased when she discovered that there was an in-store promotion offering a free toy pushchair worth £29.99 with every doll purchased. And certainly, it’s not hard to find more examples. Take, for example, an assorted pack of Num Noms, currently on sale in John Lewis for £2.99 versus £9.99 through an Amazon 3rd party vendor. 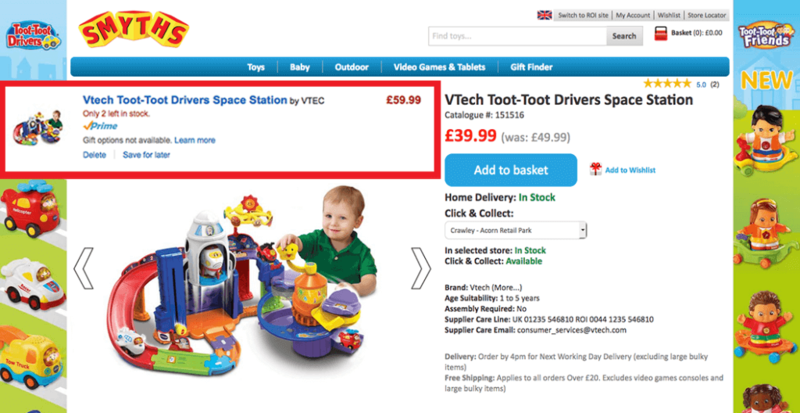 Or the VTech Toot Toot Drivers Space Station, available for £59.99 through another 3rd party retailer or just £39.99 in Smyths. Or how about the You and Me Talking doll that is 60% cheaper in Toys R Us than Amazon’s 3rd party sellers are requesting? “The ‘Buy It Now’ button has made shopping on Amazon so easy that most parents don’t question where their merchandise is actually coming from – or even whether the price is competitive,” said Ms Wilson. And while Amazon does try to deter sellers from inflating their prices, and will often add a disclaimer to the listing alerting consumers that the item is available from other sellers at a lower price, many shoppers miss these warnings, or are so wedded to the Amazon Prime program that promise of next-day delivery is enough to persuade them to “buy it now”. Only two fifths (41%) of the parents surveyed by the Institute of Mums admitted to checking prices in their local stores before ordering goods on Amazon. For most, convenience and speed of delivery trumped price. Nevertheless, over three quarters (76%) of parents polled also agreed with the statement that it is rare to be able to find products cheaper than on Amazon, suggesting that few are aware that they may be paying over the odds for certain products. “Clearly Amazon is more competitive overall and many products represent tremendous value, but when stocks are low as they are this time of year and the reliance on 3rd party sellers is higher, it can pay to shop around,” said Ms Wilson. One only needs look at the gap-toothed look of the high street to see just how much Amazon & Co have impacted the way we shop in recent years. The costs of running a bricks and mortar shop – in rent, rates, inventory, theft and wages –have pushed more and more retailers online, and claimed some high-profile casualties along the way. Yet despite this, most of us still consider shopping to be a social activity. For many, the joy of shopping lies in discovering new products and sharing our experiences with the outside world. Which begs the question, can our brief interactions with the delivery driver ever truly replace the in-store experience, or with time, will we see more British shoppers returning to the high street? The benefits to our wallets aside, if the slow moving traffic through Tunbridge Wells this morning is anything to go by, the school run might just depend on it. * We have approached Amazon for comment.